If you are a fan of Sunny Side Up on Facebook (and why wouldn’t you be ;)), then you may have seen my post yesterday about my entire house smelling like chocolate. These cookies are the reason why my house smelled so delicious. They are called “Ultimate Chocolate Chocolate Chip Cookies” and the name is pretty much spot on. 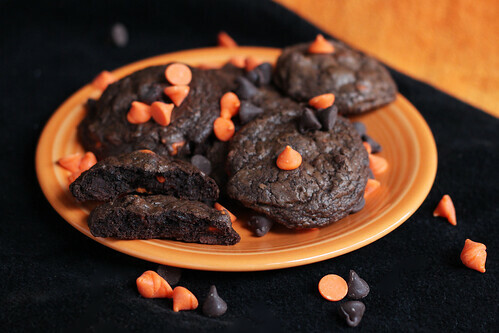 The cookies are rich with a crispy exterior and melt-in-your mouth fudgy interior. 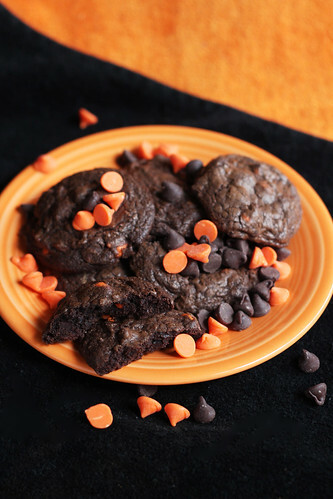 I used a bag of Halloween chips which were half orange-colored white chocolate and half semi-sweet chocolate, but you can use whatever chips you have on hand! All semi-sweet, all white chocolate, a mix of chopped up leftover Halloween candy… If it tastes good with chocolate, chances are it will taste good in these cookies! Preheat oven to 350 degrees and line a cookie sheet with parchment paper. In a medium mixing bowl, combine the flour, cocoa powder, baking powder, and salt. Set aside. In a microwave safe bowl, add the chocolate chips and 2 tablespoons of butter. Microwave in 20 second increments, stirring in between, until melted and smooth. Set aside. In the bowl of a standing mixer, beat together the remaining butter and brown sugar, until light and fluffy. Add the eggs one at a time, scraping down bowl in between. Add the melted chocolate and beat to combine. Add the dry ingredients and mix until well combine. Stir in chocolate chips. Using a medium size cookie scoop, drop 2 inches apart on the prepared cookie sheet. Bake for 8-10 minutes then allow to cool on the cookie sheet for a minute before transferring to a cooling rack. Definitely serve with a large glass of cold milk!